AD55L - G & W Machinery Sales, Inc. 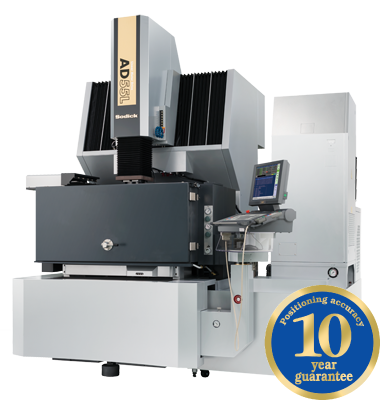 The AD55L Sinker EDM features Sodick’s Rigid Linear Motor Technology. Sodick's expertise in EDM innovation using 3D design systems, the latest CAE technologies and numerous simulations have made it possible to create an improved basic machine structure with optimized rib arrangements; this increases rigidity by approximately 70%. With the new AD55L, machine deformation is minimized, allowing for optimum performance at high-speeds and rapid acceleration of the linear motors. The AD55L Sinker EDM features Sodick’s Linear Motor Drives. Linear motor drives have been a perfect fit for CNC Sinker EDMs. The linear motor’s fast 1,400”/min axis feed combined with high 1.2G acceleration creates its own natural and even flushing condition. The positioning accuracy of Sodick’s linear motors are guaranteed for 10 years on all Wire and Sinker EDMs. The LN controller will maximize the advantages of the linear motor drive system. "LN Assist" (standard) will enable even a beginner to operate the machine with ease. The power supply unit is designed to conserve energy. The "SVC" Circuit is the Sodick standard in the process of achieving *Zero electrode wear and high-quality surface finish. To create a uniform satin surface, the "SVC" enables a no-polish finish for micro and non-forms that are difficult to polish, by producing high grade surface finishes equaling shorter processes, improved quality and prolonged stability. The new electrical supply discharge circuit "Arc-less" enables no arc machining. It greatly reduces the machining time and number of electrodes used, leading to a dramatic reduction in cost and human errors. *Zero electrode wear is an electrode wear rate of less than .06%. The AD55L features Sodick's latest LN NC unit equipped with the new "TMM3" discharge power supply, capable of high-speed, high-precision and high-efficiency machining. It is equipped with LN Professional, automatic programming functions.